After setting up the resources the next step is to create your guests a page where they can reserve. To do it add a new page, post or custom post and click on the button with red e in the classic block. A popup will appear that’ll help you to add the different shortcode’s to your website. It’s used by the form and the calendar in the free version and other features if premium is installed. Continue by selecting form. 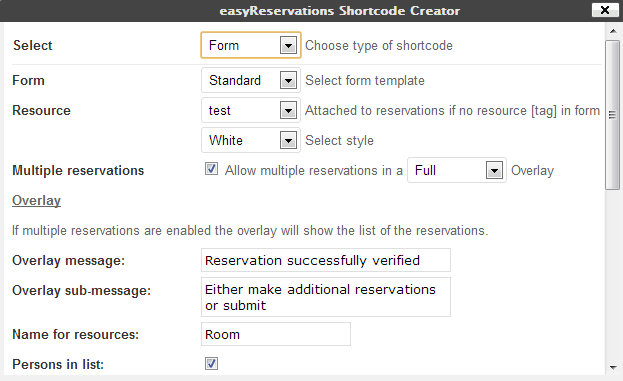 In this menu you can select the forms template, the standard resource, the style and if you want to allow multiple reservations in a row. Further you can define the messages in the overlay, after submit and after credit cards submit. To add it to the post just click on Insert and you’ll see the standard form on your page.